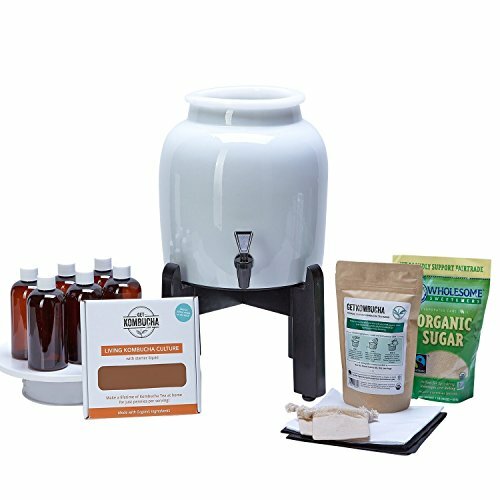 This Continuous Brewing Kit Starter Kit Includes everything you need to make 8 GALLONS of Kombucha Tea (that's 128 bottles!).. the brewing equipment, is completely reusable for a lifetime! Culture grown by 10+ year Kombucha veteran in a clean, insured work space. The All Natural Large Scoby Mother is grown exclusively with GetKombucha®'s proprietary in house formulated Organic Custom Kombucha Whole Leaf Tea Blend. Click The Yellow Add To Cart Button At The Top Of This Page To Begin Making Great Tasting Kombucha Tea Today! Imagine Having Kombucha Tea On Tap And Inside Your Home To Drink Whenever You Want It. Smart Kombucha Lovers Agree, Making Kombucha At Home Is Not Just About Saving Money... It's About Saving Time Too. This All-In-One Kit by GetKombucha® Saves You Both Time And Money. 4.9 Out Of 5 Kombucha Drinkers Love This Kit Most: Be The Home Kombucha Brewer You Were Meant To Be Without The Sticky Mess And Wasted Time Trying To Bottle Using Some Old Jar. With This 2.5 Gallon Triple Certified Brewer And Wood Crafted Stand, Bottling Becomes A Snap With Your Easy One-Touch Kombucha Dispenser Tap. Better Ingredients And More Of It: 120 Grams Of Certified Organic Kombucha Tea Blend (8 times more than other kits selling at the same price). Size Does Matter: While Others Have You Trying To Make Kombucha Using A Small Dehydrated Disc The Size Of An Oreo Cookie, This Kit Includes North America's Largest Living Kombucha Culture, 6.5 Inches In Diameter, So You Can Have Twice The Amount Of Kombucha In Half The Time! The Rolls Royce Of Kombucha Kits: The Meticulous Level Of Care And Attention That Goes Into The Creation Of This Brewing Kit Is 9+ Years Of Development. Triple Certified Lead Free Brewing Vessels, Certified Organic Whole Leaf Tea Blend (Developed In House), To Date The ONLY Tea Blend To Receive Organic Certification For The Use Of Home Kombucha Brewing. 100% "Banana Pancakes" Guarantee: We Believe Making Kombucha Tea At Home Should Be Easier Than Making Banana Pancakes. And With Our World Class Customer Support Via Email, Phone or Skype, We Guarantee You Will Too... If Not It's Free! If you have any questions about this product by Get Kombucha, contact us by completing and submitting the form below. If you are looking for a specif part number, please include it with your message.